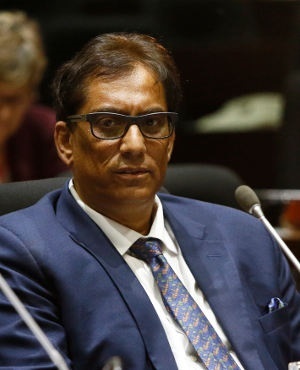 Iqbal Survé, the executive chair of Sekunjalo, has denied an accusation by the former head of AYO Technology Solutions that he ordered the changing of AYO's interim financial results to make them seem more impressive. The accusation was made last week by the former head of AYO Technology Solutions at the ongoing judicial commission of inquiry into state-run asset manager the Public Investment Corporation. The commission is investigating allegations of wrongdoing at the state-run asset manager, which manages R2.2trn in investments on behalf of public servants. AYO's former CEO, Kevin Hardy, had told the commission that the group's chief financial officer was in early 2018 instructed to tamper with the figures of AYO's maiden interim results filing to "reflect an inflated number to the market". The interim results were released in mid-May 2018. In response to a request for comment, a Sekunjalo company spokesperson said Survé "has no knowledge of this and suggests that this question be put to AYO, whom he is certain will refute this serious allegation". AYO is an associate company of African Equity Empowerment Investments (AEEI), which is a subsidiary of Sekunjalo. Hardy had told the commission he was “very uncomfortable” with the decision to inflate the numbers, but was told the instruction had come from above. He states in his affidavit that the feeling was that, "given the media noise, we could not deliver an average set or results". Hardy resigned from AYO on August 24, together with the group's Chief Investment Officer Siphiwe Nodwele. Meanwhile, AYO's external auditors, BDO Cape Town, say they will investigate the allegation made by Hardy. "We did not review or audit the interim results as this was not required," BDO Cape Town's Managing Partner Ian Scott wrote in an email to Fin24. "This is a concern to us and we want to understand what happened so we can consider the implications. "Our firm and its reputation for quality and ethical behavior is of fundamental importance. We hold ourselves and clients to a very high standard." The Sekunjalo spokesperson also denied another claim by Hardy – that Survé tried to bribe him with with an all-expenses paid move to Cape Town after he said he wanted to resign from the company in August 2018. "Dr Survé rejects the notion that the suggestion to relocate Mr Hardy and his family to Cape Town was a bribe. There was nothing untoward in the suggestion that Mr Hardy relocate or that his relocation expenses be covered." According to Sekunjalo, it made business sense for Hardy to move. ".[..] The majority of AYO’s largest clients were (at the time) based in Cape Town, it made business sense to have the company’s CEO also headquartered in Cape Town. "Further, Mr Hardy had expressed his strained relationships with some of the AYO senior team and it was felt, that with him being in the same locale as other members of the senior executive of the company, it would assist with more regular face-to-face meetings and more frequent communications to solve any misunderstandings between the parties - for the benefit of the company as a whole." Shares in AYO were trading at R14.50 at 13:00 on the JSE on Tuesday. The commission of inquiry's terms of reference and deadline were extended in late March. It is now set to submit its final report to President Cyril Ramaphosa on July 31.